- The Wolfberry Project now has 19 gross wells tied-in and producing. - Lynden's share of production is 423 boe/day over the last 30 days, of which 72% is oil. - Lynden's current Wolfberry development is primarily in Martin and Glasscock Counties and includes 3,841 net acres. Their Wolfberry development is low risk and they have had 100% success with their wells. - Lynden also has 2,469 net acres in the Tubb Prospect Area in Howard County with their first well scheduled to spud in late October. - Lynden has approximately 34,150 net acres at their Mitchell Ranch Project. - Keith Schaefer from the Oil and Gas Investments Bulletin has stated that Lynden's JV partner at the Mitchell Ranch is Chesapeake Energy! This is extremely significant in that Chesapeake has been very active in accummulating Mississippian play acreage and is one of the largest E&P companies working in the area. 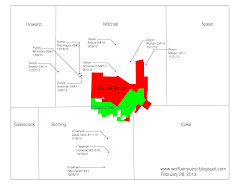 Chesapeake has undertaken a "multi-well vertical/horizontal drill program" at Mitchell Ranch. - Lynden has achieved success in three Wolfcamp intervals at their Spade 17 #1 well at Mitchell Ranch.